You are currently browsing the Carpe DMM blog archives for April, 2010. Once again my friends and I are organising the annual CiSRA Puzzle Competition, which has just opened for team registration. Part of the process of running such a competition is of course creating the puzzles, which is a lot of fun. Another part, for the sake of the competition format, is writing a series of 3 hints for each puzzle. The puzzles are worth points, and the point value decreases as more hints are released over time. We’ve actually spent many hours discussing (or arguing may be a more accurate term) how to approach the writing of hints. A major problem with trying to run a competition like this and writing suitable hints is that we get feedback from participants criticising the structure of the hints. In particular, people strongly dislike it when they feel they have done most of the hard work involved in solving a puzzle, and are stuck at the final step, and we release the first hint, and it tells them about one of the initial steps of the puzzle – a step they already figured out with their own effort. This is understandable. We’ve felt exactly the same frustration ourselves when participating in other puzzle competitions. When you’ve put in hard work and figured something out by yourself, the last thing you want to see is a hint that lets the other teams who haven’t figured it out yet catch up to where you are. What you really want is a hint that helps you. Ideally a hint that helps you and nobody else! We could write hints so that the first hint helps people stuck at the final hurdle in the puzzle, and only later hints give away the earlier bits of the puzzle. But what does that mean? It means we’re helping the good teams. The teams full of strong puzzle solvers, who are already ahead of most of the pack, because they’ve probably already solved a bunch of other puzzles that other teams are still struggling with. And we’re not helping the weak teams – the ones who really need a kick start to even know what the first step in the puzzle is. If we did this, the effect would be to boost the strong teams and give nothing to the weaker teams. It would be making the already strong teams “win more”. On the other hand, we can structure the hints so that the first hint helps people with the first step of the puzzle, the second hint helps with an intermediate step, and the final hint helps with the final step. What does this approach do? It helps the weaker teams to get a leg up on puzzles that they were really having difficulty just starting on. It doesn’t help them with the rest of the puzzle. Now if we assume the stronger teams have figured out steps 1 and 2 by themselves, maybe 20 hours ago, and a weak team is now given a helping hand with step 1 by the first hint, while the first hint doesn’t help the stronger teams… do you know what? The stronger teams will still generally solve the puzzle first! They still have the advantage of being better puzzle solvers, and the extra advantage of 20 more hours to cogitate on the final step. Hints that help the weaker teams just level the field a little bit. They don’t help weak teams to beat strong teams. And levelling the field a bit is useful. Imagine you’re on a team that is struggling to figure out how to even start a puzzle. A day later the first hint is revealed, and it’s a big hint for the final step of the puzzle – a step you’re not even up to yet! It helps the strong teams, not you! That’s discouraging – you’re falling even further behind. You may as well give up on this lousy competition. So hints that step through the puzzle in order are useful to encourage teams to stay in the competition. They flatten the point spread a bit. And they don’t really hurt the best teams – the ones who are (understandably) a bit frustrated that the other teams are “catching up” thanks to hints. Because, I’ll say it again, the best teams are going to solve those hard puzzles before the weaker teams anyway. When the last hint comes out that gives the game away, the strong teams will still beat the weak teams who have been guided through the early steps by the first two hints. So that’s the main principle we use when writing hints. We sometimes cop flak from strong teams who feel frustrated, but we’re okay with that. A second principle is that we also try to mitigate that a bit by making hints double-barrelled if we can. The first hint must provide a somewhat strongish clue about how to start the puzzle, but may also provide a more or less cryptic hint to getting past a later roadblock step. It should be slightly cryptic, to give us room to make it more obvious with a later hint. I actually argued against doing this, but some of the other puzzle organisers were so adamant that we had to give something to the teams stuck on the last step that we adopted it as an option. Anyway, the basic point of this post is that figuring out the philosophy of puzzle hint writing is difficult and full of contradictory pulls and opinions. It’s something we’ve actively spent time arguing over, to arrive at what I’d describe as a slightly uneasy truce, rather than total agreement. Further, this serves as an illustration that what many people may think of as some rather trivial consideration can be extremely complicated and involve deep questions of game-theoretical philosophy. If you’re serious about organising something like a puzzle contest, you’d better be prepared to think deeply about stuff like this. French wine is, as I’ve learnt, labelled very differently to Australian wine. 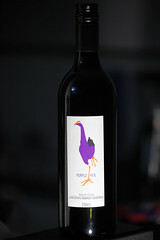 In particular, the labels don’t tell you what grape varieties are in the wine. What they have instead is a geographic region of origin, with an appellation name indicating a specific sub-style of wine from that region. The reasoning apparently goes that if you know anything about wine, then you know what sort of wine style each region/appellation makes, and don’t need to be told trivial things like what grapes they actually use. For my first venture into this mysterious world, I decided to try some Beaujolais, from the Beaujolais region of France, naturally. This region is famous for making light, fruity red wines – so light they are typically served chilled like a white or rosé – out of gamay grapes. This sounded like a good way to expand my experience with different wine styles. I visited a wine shop a few suburbs away for the first time, since it looked like it would have a better selection and more expert staff than anything local. This indeed turned out to be the case, with the guy behind the counter very enthusiastic and helpful, and as big a selection of Australian and foreign wines as I’ve seen. There were a few choices from Beaujolais, and I selected this mid-priced one pretty much randomly. 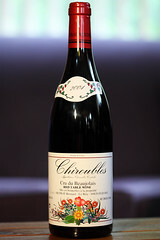 When I got home, I discovered that Chiroubles is one of the ten “Cru Beaujolais” designations, meaning a distinctive recognised sub-style of wine. In particular, Chiroubles is noted for being one of the lighter varieties, with aromas of flowers. Something to look for when tasting. We took this bottle to a restaurant where I selected a pasta dish with chicken and a light sauce. And now here comes the difficult part. The first impression of the wine from sniffing it was that it smelled very similar to the sangria we sometimes get from a nearby Mexican restaurant. Very fruity – it smelled like red wine mixed with fruit. The problem is, try as hard as I might, I could not identify any particular fruit odour. Possibly raspberries, but equally possibly I was just deluding myself into thinking I could identify something. The first sniff is just not enough for me to really nail an aroma in a wine, and subsequent sniffs just dull the smell receptors in the nose, so that it gets more and more infuriatingly elusive. The taste? Well, a similar story. Light and fruity at first, and enjoyable. Very much like sangria, in fact. Lots of “fruit”, but I couldn’t tell you what sort of fruit. It was pleasant on a quick swallow, but if you left it swirling in your mouth for a while, some tannin started to assert itself. It got stronger and stronger, until it was really quite strong. In fact, just now I’ve realised what it reminded me of – cold rosehip tea, with some extra tannin. Which is nice and refreshing in summer. The wine was definitely enjoyable on the first glass. But a second glass became… unexciting. I guess that’s the unsophisticated nature of Beaujolais. I can see why it has a reputation as a light “picnic” wine. Why do so many people distrust science, scientists, and informed scientific consensus so much? Maybe it’s old news, but I had an insight into this when looking at some stuff about Riedel wine glasses. (This is not a wine post, really.) These glasses are marketed as “scientifically” designed to maximise the experience and enjoyment of drinking a glass of wine. What’s more, they have dozens of different glass shapes, each “designed” to work best for some particular type of wine. The upshot is – if you believe this – that to enjoy your wine to the maximum you need to buy about 8 different sets of Riedel glassware. Many people can spot the conflict of interest here. Obviously it’s to Riedel’s advantage if it’s true that to best enjoy your cabernet sauvignon you need a different glass to the one you drink merlot from. So if they say it’s true, then even the mildly cynical can easily come to the conclusion that they’re just making it up. And what about those wrinkle creams? You know the ones, that are advertised as “scientifically proven to reduce wrinkles by 78%”. How do you even measure that wrinkles have been reduced by 78%? Does anyone really believe that? The culprit here is advertising. Advertisers like to use “science” to promote their products, because it has a veneer of authenticity that gets some people to trust their products. But most of us have become habituated to “scientific” claims by advertisers and just mentally filter them out or assign a low weight to them and evaluate the products on our own criteria. Science has become something that you can choose to believe if you want – and maybe you’re gullible if you believe it. Unfortunately, that’s a misguided representation of science. When hundreds or thousands of experienced scientists agree that something is most probably true because of all the research, data collection, analysis, and peer review that they’ve put in, it’s not the same as a claim on a commercial. It actually has serious weight behind it, and you better take on board the idea that what they’re saying is more likely to be true than not. Yes, there are counterexamples, but they are few in a vast edifice of consistent, established scientific knowledge. The odds of any given piece of scientific consensus turning out to be incorrect are very small indeed. The problem is, large swathes of laypeople who don’t fully understand how science operates simply look on it as another marketing move. They feel free to be cynical, and to completely disregard what the scientific consensus says. Especially if they don’t like what the message is, or it makes them uncomfortable in some way. Science is about uncovering the truth, not about concocting stories designed to sell a product. Stories can be made palatable. The truth is different; it doesn’t always fit the way we want the world to work. Disbelieving it won’t make you immune from it. Science has checks and balances to make sure that mistakes or lies don’t get propagated. That’s why it’s such a huge scandal whenever a scientist is found to have falsified data or lied about a research result. This is the absolute capital sin of science, and when it is discovered it is treated accordingly. Careers in science can be ruined by one instance. You can be pretty sure that the vast majority of scientists out there are keeping their noses clean, and when they say they have research to support some conclusion, that they really do have solid data behind it. Advertising is a completely different beast. Judging science by the standards you use to judge advertising is simplistic and misguided. But it’s a trap that more and more people seem to be falling into, alas. 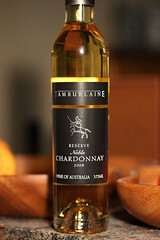 Tamburlaine is a certified organic winery in the Hunter Valley. On my trip to the Hunter Valley last year, I popped into this winery because they advertised winery tours, and I was interested to see some of the wine-making process. The tour was indeed very interesting, with a guy who was obviously keen on the whole organic side of the process, showing us the water and organic waste recycling processes used in the vineyard. We got to sample some still-fermenting white wine direct form one of the vats – the guide just opened a spigot at the bottom of a huge vat and let the juice pour into our hands. And there was a very cool fully-equipped chemistry lab, where they do all sorts of chemical analysis of the wines. After the tour, I bought a bottle of this botrytis chardonnay dessert wine from the winery shop. It’s sweet and jammy, beginning with apricot flavour, with a hint of banana. It develops into an orange taste, with the same bitterness of peel as the Jessica’s botrytis semillon we had last week. I found a good description for it on a wine site: orange marmalade – that mixture of sweet and bitter orange flavours that you get from really good marmalade. This wine also has a bit of that nutty, almost oaky kick that you’d expect from a chardonnay compared to a semillon, so it’s a bit heavier than a botrytis semillon. Very slight prickle of fermentation. Nice, but I think I prefer the semillon style.